I would like to share with the world the magic, wonder, and healing power of a truly amazing essential oil, called “Thieves.” Like some, I was at first turned off by what sounded to Me like a dark or negative name, whereas everything carries an energetic imprint, including names of products. However, once I learned why this oil was given this name, I was able to let go of any concerns about the name, recognizing that the distributors were using the oil’s legacy as part of their marketing… all well and good, you might say. The important thing is what this oil can do. Rather than repeat, it is best and easiest for you to simply go to this link (see below) and read for yourself. I have been using this oil for years, and I highly recommend it to become part of everyone’s standard apothecary (medicine bag). Travel with it, too. It will be a lifesaver… in some cases, literally! I also apply Thieves oil to the soles of My feet and to My children’s feet—when we travel, during flu season, when around people who have major colds or infections. It will help keep your kids healthy when their classrooms are full of runny noses and infections, and it does the same for you when your roommates and office workers are sneezing and coughing all around you. On a side note, clove oil (the main ingredient in Thieves) is one of the best remedies for toothaches, when applied directly onto the gums around the ailing tooth. This oil is quite potent, though, and may be difficult for small children and some adults, so use carefully and sparingly. In late May 2009, the Louix Dor Dempriey Foundation opened the majority of its events to the public. Soon thereafter, our Public Relations crew launched Enlivened Spirit Meetup Group, an online social networking website that advertises group meetings around the world. The link for Enlivened Spirit is http://www.meetup.com/Enlivened-Spirit-Meetup-Group. On April 12th, the ashram held its Annual Spring Gardens Ceremony and Celebration at the Sanctuary. Pranananda began the event with an opening prayer. This took place as the gardens were in peak bloom. 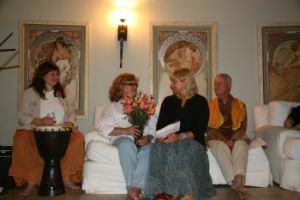 During the prayer ceremony, Pranananda invoked the Nature spirits, celestial beings, and God’s blessing upon all our new endeavors for this year, honoring the season and the energies of Spring, and creating a divine union and synergy with all of heaven and earth to empower and bring forth quantum growth, harmony, beauty, and success in all areas of our lives. After the prayer ceremony, we enjoyed a bountiful brunch in the gardens, followed by several hours of devotional singing and communing with one another. As part of His annual tradition, the Master took camera in hand and personally photographed all the many flowers and plants which He spends much of His time caring for throughout the year. Click here to view a beauteous floral slide show while listening to Louix’s annual prayer ceremony and celebration of Spring. 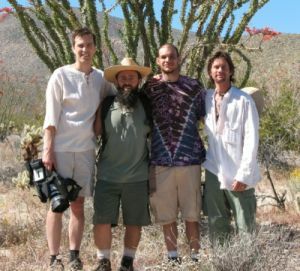 From April 17th – 19th, the men of Prema Drala Ashram went on a vision quest to Anza-Borrego Desert. They fasted the entire weekend, meditated privately, and took hikes in the desert wilderness, taking in all of its beauty. During the evening they had a fire ceremony and jam session which lasted late into the night. They began the following day with a Mayan sun salutation led by Guruji before their long trek to a mountainside of glacial boulders, where each man picked a secluded cave wherein he would contemplate in silence for the next 10 hours. Pranananda led the men back to the camp in the late afternoon. That evening the silence was broken, and the men recounted their experiences of the day around a crackling fire under the stars. As part of our Grace in Action service projects, on Earth Day (April 25th) our community joined about 60 people for tree planting at Doheny State Beach, in Dana Point. Whilst replanting the campground and campfire center with an assortment of 20 native Californian trees and shrubs, they were able to make new friends, spend time in nature, and help source the earth—a perfect day! 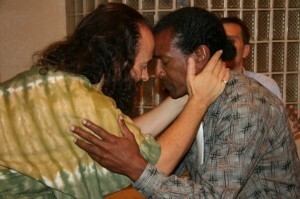 On April 26th, 22 disciples and guests gathered at the La Serra home for an afternoon Q&A session with Pranananda. Initially He led a guided meditation that opened people’s hearts. Afterwards, Pranananda cleverly gave His enlightened perspective on a range of topics, from healing cancer to twin flames. After the event, many people thanked Pranananda and expressed their gratitude for having heard Divine truth and understanding. 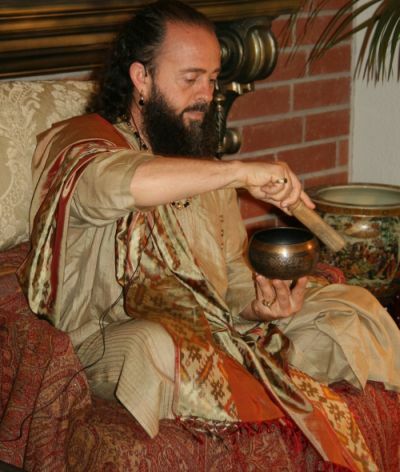 On May 30th, Pranananda’s long-time friend Dr. Gabriel Dery and his wife, Marina, hosted the ashram for an evening of devotional singing at their exquisitely decorated home in San Juan Capistrano. Some songs brought people to their feet and they were dancing with joy; others, such as “Hari Om,” brought in an intense energy, leaving people divinely intoxicated. On July 7th, we celebrated Guru Purnima with an evening of devotional singing at one of the ashram homes. On August 1st, Louix gave darshan to over 60 people at Prema Drala Ashram. Prema Drala's own kirtan group, Pranam, played devotional music quietly in the background as each person came before the Master to receive His personal blessing. A growing community of spiritual seekers in Las Vegas invited Louix to their city for the first time during the second week of July. Kitty Courtney and Sean Brown, who lead several spiritual groups in Las Vegas, graciously hosted Louix and a team from Prema Drala Ashram for a series of events at their home in Henderson. Eighty-five people came to receive Louix’s blessing, which, for many, invoked profound transformation and exalted states of bliss. Click here to see more coverage Louix's visit to Las Vegas in July 2009. 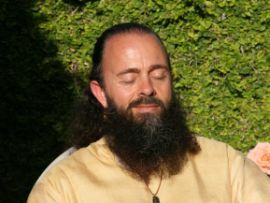 Join these teleconference calls and learn from a spiritual Master, Louix Dor Dempriey, simple, practical tools for spiritual living that will accelerate your path to self-mastery! 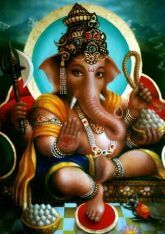 Louix will offer His darshan and Divine guidance in a series of teleconference calls on the first and third Thursday of every month. These calls—available to anyone worldwide—will include discourses, the opportunity to ask Louix questions on any topic of personal or global concern, and the practicing of sacred spiritual tools such as toning, chanting, and brief, guided meditations. All calls will be recorded and made available for future listening to all those who register. Click here to sign up for a teleconference call. Join us for a bliss-filled evening of singing in celebration of Ganesha Chaturthi. An integral part of the bhakti yoga tradition, devotional chanting is a musically meditative way of invoking the Divine Presence. This is a wonderful opportunity to come together for a night of inspiration and upliftment. Pranam is an ensemble of musicians from Prema Drala Ashram who blend Indian kirtan and contemporary music styles to create an uplifting and devotional musical experience. Drawing from many cultures and traditions is part of their mission of uniting all peoples on Earth as one family in the heart of God. Sunday, August 23rd, 7:00 - 9:30 p.m.
Visit www.yogashaktistudio.com and sign up today. $10 pre-registration; $15 at the door. Thursday, September 19th, 7:00 p.m.
Tuesday, September 22nd, 7:30 - 9:30 p.m.
Saturday, October 10th, 7:00 p.m.
Thursday, October 22nd, 5:00 – 9:30 p.m.
Saturday, October 24th, 10:30 – 5:30 p.m.
Thursday, December 17th, 7:00 p.m. The Country Place, Olinda Creek Rd. Vegan meals and accommodation included. Date to be announced, 6:00 p.m. Ocean Place Spa and Resort, 1 Ocean Blvd. In the first half of 2009, the Louix Dor Dempriey Foundation has been creating many new opportunities to share the love and wisdom Louix has already brought to so many. For example, in just the last few months we have established a series of ongoing public events with Louix, such as Darshans, Evening Meditations, Q&A’s, and (our newest program) Teleconference Calls; as well as Satsangs, Community Service, and nights of Devotional Singing. 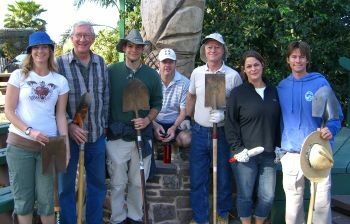 Since the Foundation’s incorporation in 2007, our dedicated team of volunteers has focused on creating the formal infrastructure for this ministry (which began in 1996). We are happy to announce that these efforts have culminated in the recent submission of our petition for non-profit status! We are now in the final stages of creating the legal framework to officially launch the Foundation and its fundraising efforts. One aspect of this is the design and printing of the Foundation’s first full-color brochure. To accomplish these goals, which will expand the Foundation’s capacity to serve in even more far-reaching ways, we are first reaching out for financial support to those who have been part of our spiritual family over the years, in order to raise the funds necessary to complete this phase of our growth. We count on those like you, whose lives have been blessed by this ministry—as well as upon those who share and believe in our mission—to help us fulfill our goal in service to humanity. With utmost gratefulness, we thank you for being part of this vision and for helping us to share Louix’s love and teachings with the world. It is your loving and generous contributions which enable us to touch the hearts of people far and wide. We shall keep you apprised of the exciting new developments within the Louix Dor Dempriey Foundation as they happen. God bless you. As we enter this exciting phase of growth and expansion, there are many opportunities to serve the Foundation. To learn more about volunteer opportunities and various service projects, please contact Dria Kasunich at (888) 288-3735 or dria@Louix.org (U.S. and other regions), or Kharananda Mayi at +61 3 9885-2993 or kharananda@Louix.org (Australian inquiries). To schedule an interview with Louix, publish His teachings, or discuss media opportunities, please contact Lisa Leslie, Director of Public Relations.